No single country has contributed more to the world of cuisine than France. For sure, folks around the world have figured out how to cook food and serve it, but it's the French who codified the process and lent us words like chef, sauté, and restaurant. France enjoys a unique physical situation, with both the olive-oil-pressing Mediterranean and the butter-churning north, coastlines teeming with sea life as well as rich interior lands for grazing livestock, and a variety of soils and climates and elevation that make for a stunning variety of cheeses, wines, and other delicacies. Add to this a culture that fiercely appreciates and legally defines regional variations, an economy that centralizes transportation and commerce through its capital, plus a colonial legacy and a culinary porousness that's incorporated foods from neighbors near and far, and you've got a delicious gargantuan of a cuisine that's incredibly intimidating to unpack in a single meal. It just so happens that our very good friend Sarah-Doe is the great-great-granddaughter of the author of La Bonne Cuisine de Madame E. Saint-Ange, a book that's been described as "The French Joy of Cooking," a foundational text to both Julia Child and Chez Panisse, and continually in print since its 1924 publication. What's more, her cousin Julia is an accomplished food editor and cooking instructor who's done plenty of research on French cooking history in general and this same ancestor in particular. How relieved I was when Julia agreed not only to help plan the meal, but also to come from Ithaca for the weekend to join me in the kitchen! 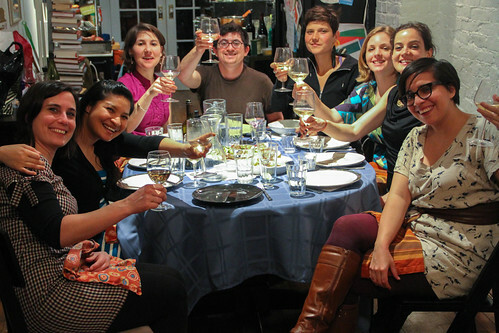 We had three goals for the meal: to make it a properly structured multi-course affair, represent as much regional diversity as possible, and choose dishes that Laura would be most likely to enjoy because it doubled as her birthday party. A secondary guiding factor was to cook dishes appropriate to the season, which happens to be Easter week. Although we did seven (!) 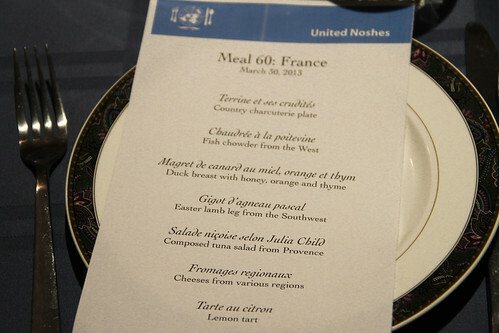 courses, paired with wines, there's still so much we left out — sorry if you were hoping for crêpes or beef or a potato side dish or anything with chocolate! —but alas, there's only so much room in the stomach and the kitchen. Our valiant guests for this epic meal were Lisa, Anna, Julia, Tennessee, Kirsty, Sarah-Doe, Elsa, and Jessica. Oh, before we get started, a shout out to Thirst Wine Merchants in Fort Greene, who patiently and enthusiastically provided all the wine pairings! Hors d'œuvre means "outside of the work," so applied to the meal, it means a little something to get you started before things ramp up. 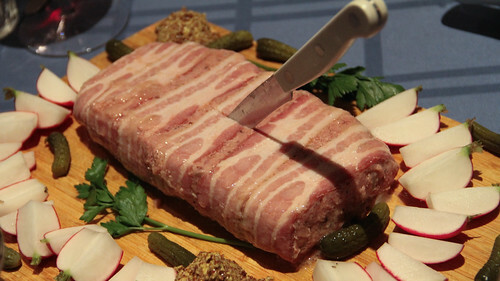 Somehow, in the French logic, a cold, spiced loaf of various ground-up meats is a nice light way to spark the appetite! Anyway, I thought this recipe turned out super well. It wasn't terribly difficult to make, in fact the part that gave me the most trouble was that the water bath plus the terrine proved too heavy for my oven shelf so it kept falling. The allspice, cream, and cognac make it all pungent and rich, the moderate amount of chicken liver makes it smooth, the pork and veal are just fluffy and fresh enough, and the bacon wraparound is both pretty and practical. This recipe does make quite a lot, we had half left over after enjoying it quite a bit. Consider serving it as we did, with radishes, cornichons (those sour little pickles), and grainy mustard, and of course a good crusty bread. 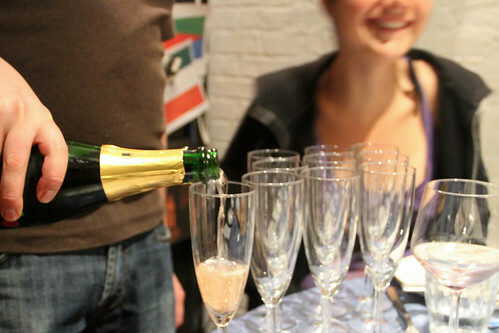 Wine: A birthday party needs some bubbly! A true Champagne was a bit out of our price range, so we went with Buronfosse Cremant de Jura, from the mountains east of Burgundy. Made from pinot noir grapes with the skins removed just after crushing, it retains a light pink hue but is considered a white wine, a style known as blanc de noir, or "white from black." This was definitely not the sort of crisp, nutty, yeasty-nosed flute you'd get from Champagne, but rather a plenty dry yet intriguingly fruited wine that paired surprisingly well with the spices and richness of the terrine. 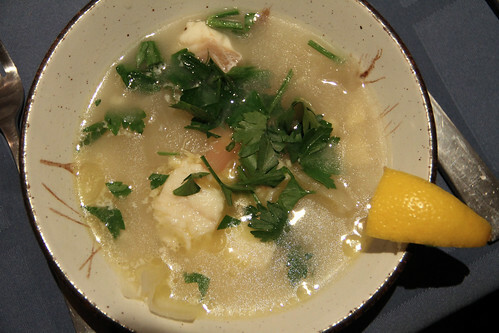 A classic French formal meal has both soup and fish courses, and we tackled both with this really nice stew. It's a deceptively simple recipe, little more than butter, onions, firm white fish, and wine. French cuisine isn't always restrained, but when it is, and a dish is treated less as a masterpiece of the chef but rather the addition of just enough heat and technique to make the inherent flavors of the ingredients shine through, it can be sublime. The finishing sprinkle of parsley and squeeze of lemon add just enough freshness to counterbalance the rich butter, fleshy fish, and earthy onions. Wine: The famous Loire Valley forms the northern reach of this region. We went the Domaine de Salvard Cheverny, made from sauvignon blanc. The reviews correctly talk of grapefruit, which is the most common impression for this grape, but what I remember more than any fruitiness is a really restrained sweetness that balanced the buttery broth so well. In fact, several guests commented that this pairing made them reconsider a general aversion to white wine! I'm gonna be honest with you all: I'm not sure I've ever made anything this delicious before. I'm serious. 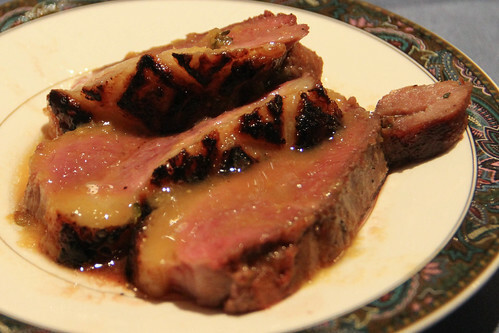 Unlike chicken breast, which is very lean, mildly flavored, and dries out easily, duck breast is rich, robed in some of the best fat Mother Nature has invented, and an excellent canvas for bold flavors. Remember when I praised that part of French cuisine that's all about the simplicity of ingredients? Well, this is the other side, the one that makes some absurd combinations to be greater than the sum of their parts. The technique is actually quite simple, just a long marinade followed by the classic technique of cooking on the stovetop and finishing in the oven. But oh my God — I mean mon Dieu! — this dish was just amazing. The honey, orange, and thyme all contributed their distinctive flavors in abundance, in an unholy marriage with the gamy duck. Plus, since it's cooked medium-rare, there's still a visceral mouth-feel to the flesh, so you get just the right number of chews to have every second be a beautiful one. I guess I shouldn't regret that each person only got three slices, since there were after all six other courses, but I probably could have served close to one breast apiece if it were the main event. Wine: To stand up to the complex and deep, yet also sweet, flavors of this dish, the choice was the Domaine Elodie Balme Côtes du Rhône Villages Roaix Champs Libres. Behind that really long name is a short story, of a woman who at 23 started making her own wines in a part of southern France famous for its particular blend of grapes — in fact, I find a Côtes du Rhône to be generally my sweet spot for rich flavors, balanced earthiness, and good value. This wine was no exception, though I found this one a little rougher around the edges than some of the bigger commercial brands. While I generally appreciate a good, deep red like that, especially to appreciate on its own, I think at this point in the meal and with such a knockout dish, something a bit gentler, like maybe a Burgundy, might have done better. 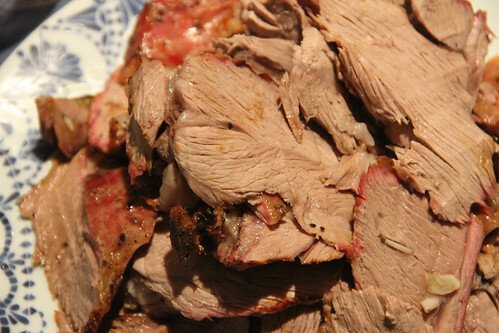 This is one of those back-to-basics recipe, really just one big ol' lamb leg, rubbed with salt, pepper, thyme, and oil, and studded with garlic slivers. I don't really know how long it took (2.5 hours? ), and the temperature was wildly inconsistent because at one point the oven freaked out and somehow went past 500°! (I really don't like this oven very much.) But luckily I managed to get it out at the right time, and it was really tasty. It even got a sort of red glaze on the outside, kind of like Chinese pork! Yum. 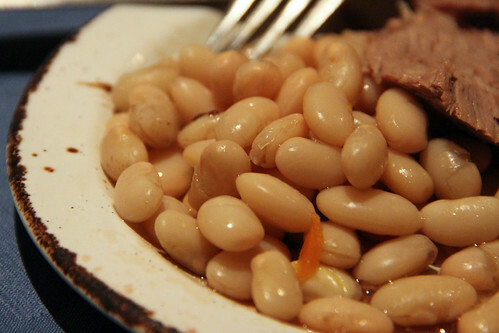 I should note that we also made the beans referred to in the recipe technique but not the ingredients. One pound of Great Northerns turned out great, the clove and bouquet garni creating an abundance of flavor that our non-carnivorous guest really enjoyed. Oh, protip for Brooklynites: if you're looking for well-priced lamb, make your way to one of the halal butchershops on Atlantic Ave. This leg, from the butcher between Court and Smith, across the street from the Y, cost just $6.50 per pound, and was extremely fresh. They've also got goat, if you're into that. Wine: We tried two different bottles with this one, both of which happen to have sorta punny names. The first is Le fruit du hasard (a French idiom meaning "the result of happenstance") from Domaine du possible in Roussillon, in the far south corner adjacent to Spain. It's a grenache-forward wine (or garnacha if you're more familiar with Spanish varietals), pretty fruity with enough terroir to stand up to the lamb, a good choice. The other was a lot more ambitious, an unsulfured, biodynamic one from the upper Rhône called L'indigène sulfureux, apparently meaning that all the sulfur in the bottle is naturally occurring. As the linked review implies, it's not a very welcoming bottle, it almost defies you to spend enough time with it to appreciate the minerals and funk. But this was several courses into a dinner party, and we just didn't have the time of day to give it! 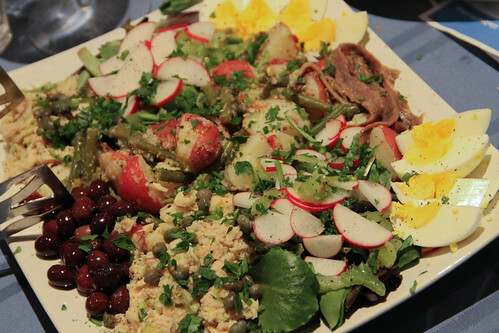 Thanks to Julia Child, this delightful combination of potatoes, tuna, boiled eggs, olives, and various raw and cooked vegetables in a mustard vinaigrette has become the French salad par excellence to Americans. I gladly handed the reins to Julia for this one, as she boiled, chopped, whisked, and arranged this incredibly beautiful plate, composed in such a manner that each guest can choose their favorite elements. The dressing was particularly tasty, perhaps enhanced by the herb-infused vinegar I'd started several months ago and forgot about until I found it! This is a great dish to make ahead of time, but if you do, follow the advice of Julias both old and current and toss the still-warm potatoes in the vinaigrette. It'll keep the potatoes moist and the heat helps release more of the flavor of the sauce. Wine: Causse Marines "Les Greilles" from Gaillac, in the southwest near Toulouse. Honestly don't remember a ton about it, other than we weren't as impressed by this as we were with the other white wine. We're a tough crowd. By this point in the meal we were rather stuffed, but we somehow found room to heartily sample a variety of cheeses of different styles from around the country. 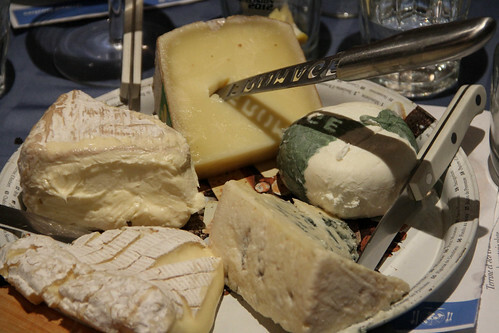 The cheeses were served with bread, thinly sliced apples, and grapes. Chabis Feuille: a pleasant, soft chèvre. Came wrapped in some sort of leaf-shaped paper, which was a bit odd. The cheese was pleasant enough, but I'd been hoping for a bit more tartness. Comté: Perhaps the best known of firm French cheeses, and what a delight it is. From the mountains near Switzerland, it has a nuttiness similar to Swiss cheeses such as Gruyère, though it's sweeter and has a creamier mouthfeel. Délice de Bourgogne: The sign at the supermarket called this fantastically goopy cheese from Burgundy "what St. André was before it sold out." If you like the buttery richness of that cheese (you may have seen it at Trader Joe's), then you'll just love this one, with a mild and delightful bloominess and a texture so soft it's almost melting even at fridge temperature. Normanville Camembert: From Normandy, in the northwest, this famous cheese is like the spunky younger sibling to brie — a similar composition and texture, but with a lot more of that sweet-moldy flavor. In fact, I almost found this one to be a little too pungent, giving me that odd dryness in the back of the throat. Roquefort: The classic, surprisingly sweet, strong yet easygoing blue from the South, such a staple of the cheese world that its lent the name to one of the primary cheese-making bacteria strains, penicillium roquefortii. Lovely as ever. To welcome the spring, and to celebrate one of Laura's favorite flavors, we wanted to make a simple and classic lemon tart. Turns out there are a lot of different recipes, all of which seem to try different techniques to thicken it up. Madame St.-Ange's recipe involves a grated apple, another one I found has you make a sabayon of egg yolks and lemon juice cooked slowly and painstakingly on a double boiler. I then did what I've done so infrequently in five dozen noshes: I opened up a cookbook on my shelf! 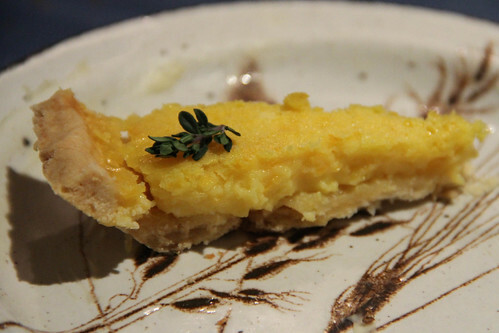 And in the parsimoniously labeled French, I found just the thing: a lemon tart with simple ingredients and technique. Julia made the crust from memory — three cups flour, two cut-up sticks butter and a pinch of salt in the food processor until crumbly, then a tablespoon each of ice water and cognac until just massing together — and from there it was a simple task to whisk together the filling and bake it off. It set very nicely, a rich but slightly fluffy custard with a bold lemon tang. It was an evening of five hours, seven courses, and about nine bottles of wine, plus lots of laughs — something about friends and food and wine tends to go very well together. We owe an enormous debt of gratitude to Julia for her time, expertise, and enthusiasm, I feel both spoiled and honored to have shared a kitchen with her. As it was Laura's birthday party, she chose to have the donations go toward her fundraising goal of $1,000 for Planned Parenthood, as she's joining their team for the Five Boro Bike Tour next month. If you'd like to make a donation here, it would sure be appreciated. Laura's heading up to the Hudson Valley for a two month artist residency, so we'll be taking a bit of a hiatus through the spring, but we'll definitely be getting back at it in June. 60 down, 134 to go!